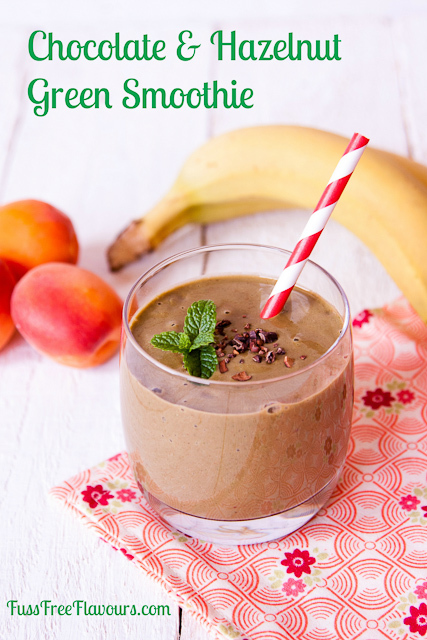 Chocolate and hazelnut is one of my favourite flavour combinations, easily enjoyed in this chocolate and hazelnut spread green smoothie. This great recipe adds a healthy boost from a handful of fresh kale. How do I make chocolate and hazelnut smoothie? As with most smoothies, it’s a one step process: blend everything together until smooth, then enjoy! By using chocolate oat milk, there’s no time spent melting pure chocolate or trying to blend bar chocolate. One thing that does make a difference is using a power blender, if you have one available. It really gives a silky smooth result. If you try this Chocolate & hazelnut spread smoothie please tag #FussFreeFlavours on Instagram or Twitter. It is amazing for me when for me when you make one of my recipes and I really do love to see them. You can also share it on my Facebook page. Please pin this recipe to Pinterest too! Thanks for reading Fuss Free Flavours! 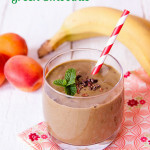 Delicious chocolate smoothie with added leafy greens. Tastes like Nutella! Put all the ingredients into the jug of an elite blender and whizz until smooth. Serve immediately sprinkled with the cocoa nibs.